Making collection of lots of mp3 files is addiction for many of us. We always wished to squeeze more mp3 files in same amount of available hard drive space. This is possible by changing bitrate of mp3 files which results in reduction of mp3 file size without too much effect of mp3 file quality. MP3 Quality Modifieris a free and very easy to use tool to change bitrate and reduce size of mp3 files. Just download, unzip and start using this application (yep, does not require installation). You can add specific files or folders containing mp3 files. You can select bitrate in terms of kbps or use present options like: high quality, portable, compromise, very low quality. Hit the start process button and this application process all the selected mp3 files for specified bitrate. 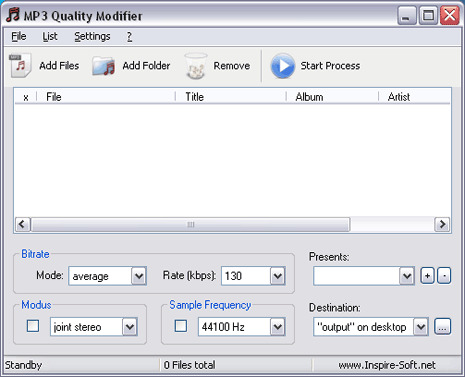 ‘MP3 Quality Modifier’ is used to modify the mp3’s quality, by changing the bitrate. To be frank, I do not like any song in bit rate less than the normally available 128 kbps. Below this it becomes detectable that the quality has reduced.Instead of reducing file size ,it’s better to convert it to say AAC which retains quality even at somewhat lower bit rate . The usefulness of the program is for people like me that have multiple albums recorded at 320kbps years ago and now running out of space on a mobile player.